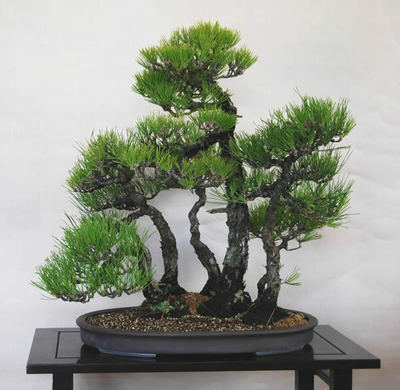 A pine tree will be called bonsai when it is put in a pot. At first, it is cultivated in an unglazed pot, and then transplanted to a glazed pot. This is the repotting which enhance the tree's value. Kiyoshi Hiramatsu, Seijuen bonsai garden in Takamatsu's Kokubunji town, is busy with the repotting from the end of March to the whole month of April. Young trees are repotted in two or three years, old trees are done in three or five years, and shohin trees are done in one or two years. As a standard, the best time for repotting is when the roots are intricated and the soils get entangled. Usually he repots a tree to a pot, but sometimes plants many trees together as Yoseue (group planting). He showed us the charm of Yoseue. First, he prepared many Kuromatsu trees. In the preparation, the main tree is already decided and others are chosen during the work. After completed, the Yoseue has great atmosphere of nature as he said. Repotting is a stressful work for trees because it cuts and pulls the roots. During the work, it must give a full attention to protect the roots. The soil is important. The mixed soil of river sand and Akadamatsuchi is well drained so Nebari, branches, and needles become better. In addition, watering after repotting is also important. It is said, "Water for 3years." Artists give water "discussing with trees." Many fanciers sometimes wither their favorite trees from lack of water. Bonsai gains the flavor in a pot as time goes by. 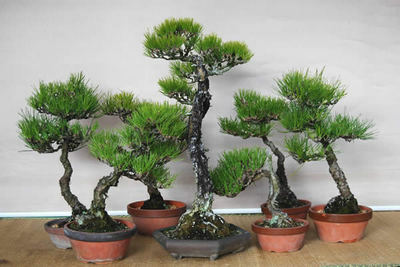 Especially the tree over 50 years old raises in value on each repotting. Transplanting in spring and training in autumn make it more valuable. So it is also important to choose a promising pot. Now Tokonameyaki pot from Japan and Watari from China are popular.